Apps are more aggressively killed in Android 9 (Pie) in the background as in earlier Android versions, which causes Ampere's notification to disappear from time to time, because Ampere is more often killed from the system in the background to keep the battery draining at a minimum. Turbo charge, Dash charge etc. There are a lot of fast charging technologies used by Android device manufacturer, but all of them have a common point - none of them are compatible with Google's pure Android. Therefore it is not easy to detect them. In fact, every manufacturer and even every device reports the state of the fast charging others. 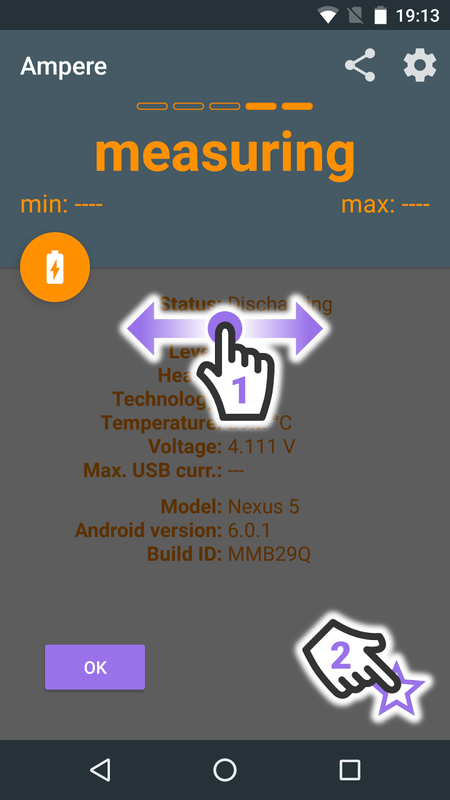 The research and hunt for such fast charging status interfaces can even only be started if a real device is at hand or if a dedicated user has such good technical Android knowledge that he can support the developer with proper information and even with testing. 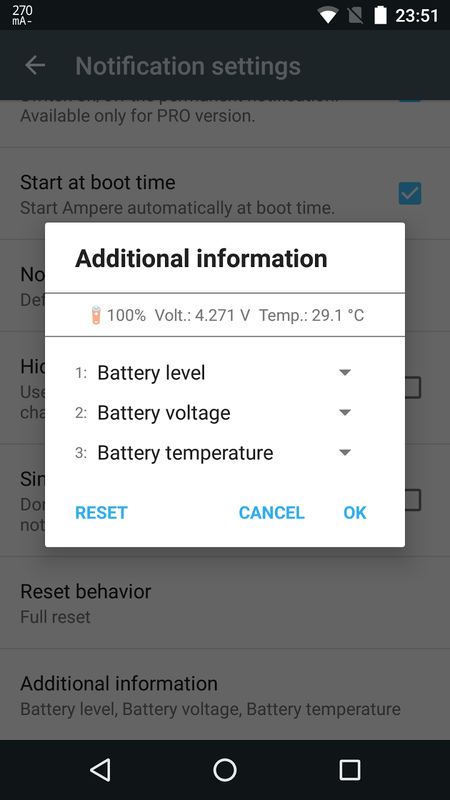 Luckily I got my hands on an OnePlus 3T, so I was able to do some experiments and later I was able to include the Dash charge detection into Ampere. The OnePlus 3T plays nicely and reports everything correctly and accurate. It can be seen how big the differences between the charging currents are. The only flaw I found is the value of the maximum USB current during the Dash charging. According to the specs it should be 4000 mA in case of Dash charge, but the system reports 1800 mA. It is not a big problem though. Android 7.0 (Nougat) adds support for displaying more than one app at the same time. One handheld device can run two apps side-by-side or one-above-the-other in split-screen mode. This means that several apps can share the screen at once. For example, a user could split the screen, viewing a web page on the left side while composing an email on the right side. 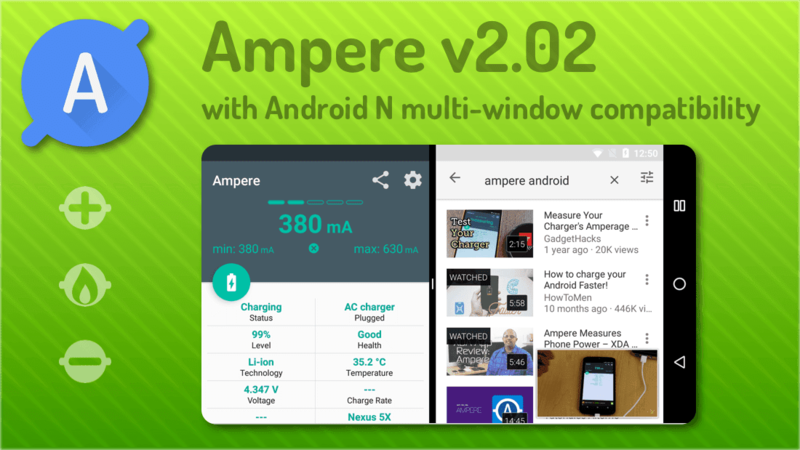 With this release Ampere can be used on Android 7.0 (Nougat) in multi-window mode. A special ability of Ampere is, that it measures continuously further while the other app is used. 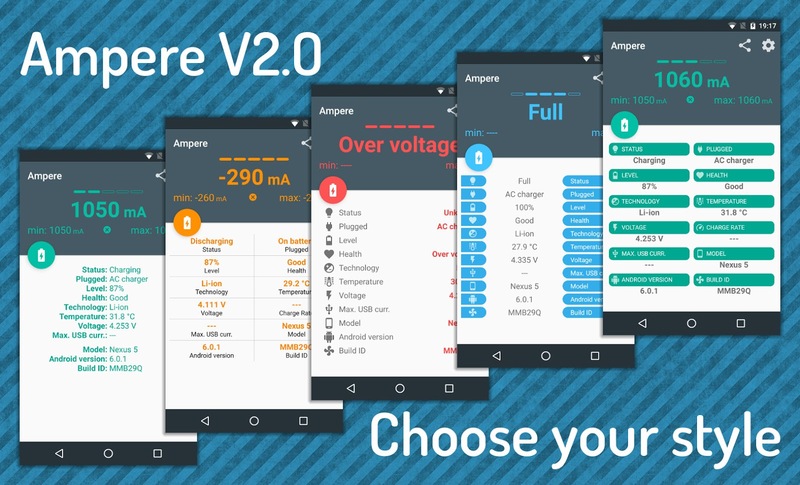 Ampere v2.01 has been published on Google Play. 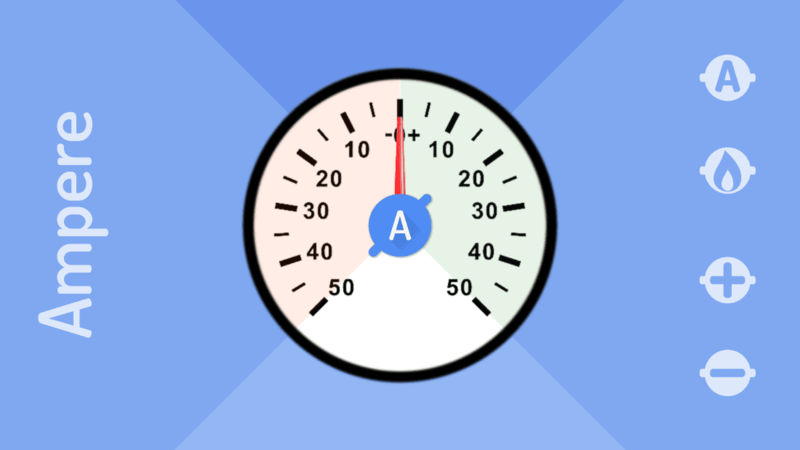 This time Ampere got more stable with a few bug fixes. Also 3 new translations are in this release available. For new users (after a fresh install) ampere chooses the system language automatically (or chooses the English language if no translation is available). 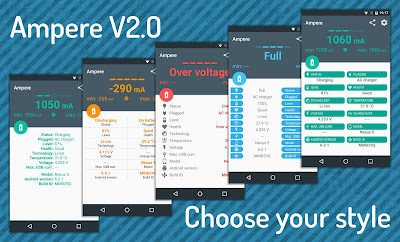 Ampere v2.00 has been published on Google Play. Material design is a fine thing, but it doesn't mean that every app should look the same. There are more than one approaches if it comes to design. To give the choice in the hand of the users Ampere now offers 5 different display styles. Every user can individually decide which style is his favorite and can set it with the star (in the right bottom corner) to stick with the selected design. 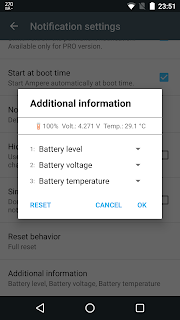 Ampere has now a redesigned notification information selector. It is now possible to select the information a user want to see in the notification in a more advanced way. The selectable information has been enhanced with the battery voltage and the battery temperature. 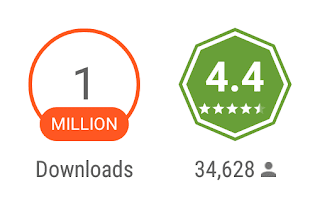 I am very proud to announce that Ampere have achieved to get over one million downloads on Google Play Store. The 1 million installs wouldn't be possible without the nice users, the great translators and the many-many enthusiastic people (on G+ and XDA Developers) who helped to test and to improve the app. Thank you all for this great success! Ampere v1.56 has been published on Google Play. If you have an USB-C device and you want to know, if your USB-C cable is an USB-C spec compliant cable, you can do it with Ampere. Here is the description how to do it. 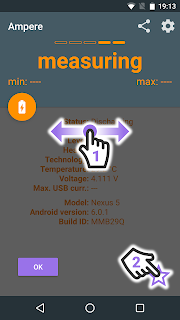 On Nexus devices is the measurement interface in Marshmallow (Android 6) unfortunately not working (always 0 mA). This is a firmware bug. 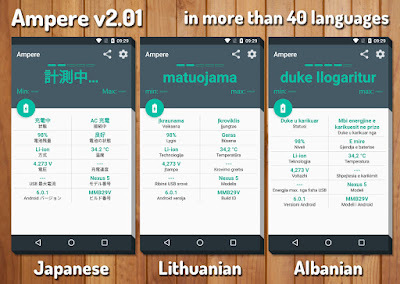 Please use the "Old measurement method" which is still fully functional also in Android 6.